In South Africa, still struggling with the legacy of apartheid, there were worries that women's health issues would be overlooked. So a group of women in Johannesburg formed the Women's Health Project to ensure that their needs and experience were included in the decision-making process. 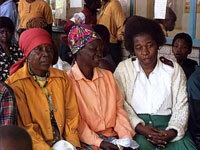 Their work is now being used by the World Health Organization as a model for other developing countries. Teach a Woman How to Fish and... - Sea farming empowers women in Fiji. Dry Days In Dobbagunta - Literacy program spurs anti-liquor campaign in rural India and empowers women. The Alarm Rings Softly - Caribbean women use drama and reggae to fight domestic violence. The Amahs of Hong Kong - Filipino women exploited as maids in Hong Kong. Footprints of Sorrow - Guatemalan war widows fighting for human rights. "Express(es)...women's desire for independence, self-sufficiency and the important role of having a voice in the process of decision-making...fast paced, yet informative.. geared toward the advanced high school student and above...has a place in all video collections in the areas of Women's Studies, History, Sociology and Anthropology. Highly Recommended."